We have recently launched a brand-new service – Going it Alone – designed to support advisers and planners as they embark on becoming directly authorised. 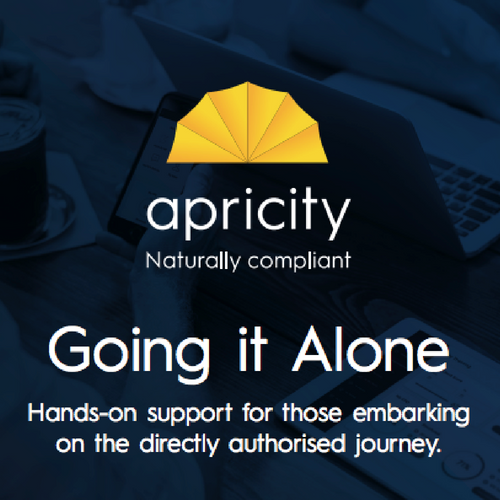 It’s the Apricity mantra to offer a service that makes life that bit easier and Going It Alone is no different. Why have we launched the Going it Alone service? We hear lots across the profession about the confusion advisers and planners face when considering their options for going directly authorised. There’s a lot of uncertainty when advisers are going directly authorised for the first time – a big part of this is the FCA application which is something we can support with. There is more to it than just the initial application though – it’s about helping firms set up their systems and processes, challenging them to make some big decisions regarding risk and research tools and also things such as knowing how to segment, and target, ideal clients. These are all fundamental to setting up a successful advisory business and the ‘Going it Alone’ service has been designed to support advisers through the whole process. There’s a real need to help, guide and support individuals, and new firms, along that journey. At the moment we haven’t seen this sort of help available and we couldn’t help but ask ourselves, why? Surely there will be countless advisers out there who are itching to take the step – and we plan to be the ones to help them do it. What do we think are the main challenges advisers face when looking to set up their own firm and seeking FCA authorisation? Advisers need to remember that when they are seeking authorisation from the FCA, they now have two full time jobs. That of an adviser, and that of a business owner. Being able to put their business owner ‘hat’ on and approach the application from that angle, is the fundamental to a smooth transition. So, a key challenge therefore can be when advisers are focussing too much on the actual advice they plan on giving – and less on the overall business structure – and this can play out in the cash flow and business plan they draft. What three areas do we think new businesses need to address in order to be successful? No firm can be everything to everyone – so you need to define your preferred clients / types of advice and focus on them. Process, process, process. Centralising and creating processes can seem a bit of a pain at the outset, but will make life so much easier as the business starts to grow. Fundamental to any business, not just advisory ones, is having an idea of where they are going. A business that wants to be a lifestyle business (with one to five employees) will have a very different journey to one that wants to be a high growth business. Making decisions every day will be so much easier if this has been considered and planned at the beginning. How can firms know if they have the right set-up, firstly, to receive authorisation and secondly, to build a sustainable business? We would review your business plan as part of our support with the Going it Alone service. We can use our experience with FCA applications to advise whether the FCA are likely approve based on that business plan, or whether changes are needed, (to try and streamline the time the application spends in the FCA hands!). The FCA are looking for viable and sustainable business – and so having a robust business plan that meets these criteria, should meet both objectives. We will offer you guidance around selecting the preferred structure (limited company vs partnership vs sole trader) and how to apply. We can then review and provide guidance on the business plan and cashflow and overall, do all the checks that the FCA are likely to do. This helps pre-empt any issues or questions the FCA may have. We’ll also confirm if a significant event disclosure needs to be completed, and help with the appropriate paperwork. Once submitted, we can be copied in on emails from FCA (though the response needs to come direct from you, the adviser) but we can help answer any remaining questions, with the aim being that these are minimal as we have pre-empted / dealt with most of them at outset. How can we help you survive your first year of business? As you should know by now, we’re all about making sure compliance is naturally embedded in a firm and we believe what’s crucial to that ensuring the set-up is correct at the outset. Getting all of this stuff working right at the outset and tested over the first year, will result in a business with easy to follow, repeatable processes, with ‘being compliant’ a natural output of that, rather than an ‘extra’ thing you have to think about. Sounds perfect – what should my next steps be? Quite simply, drop us a line and we’ll talk through your current position, where you want to be and how we can offer you the support you need. For a bit more information on our Assess, Build & Create process, along with pricing click here.